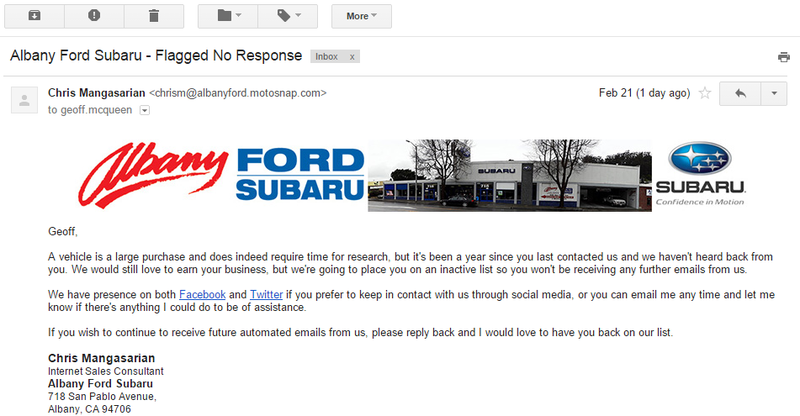 This one sold itself as an ISI nominee from the subject – “Albany Ford Subaru – Flagged No Response“. As much as I love getting an email with subject of the sender prominently displayed (hint: it is better to write a subject that your audience cares about), the inclusion of “Flagged No Response” as part of the subject was a unique touch of incompetence on the part of the folks who set up their Marketing Automation on Motosnap. Also impressive was the inclusion of the big banner image – in a world where people are increasingly reading emails on their mobile devices, a big wide image like that with that amazing logo and picture of their building (?) is also a big example of what not to do.